I am a pinstriper with over 30 years of experience. 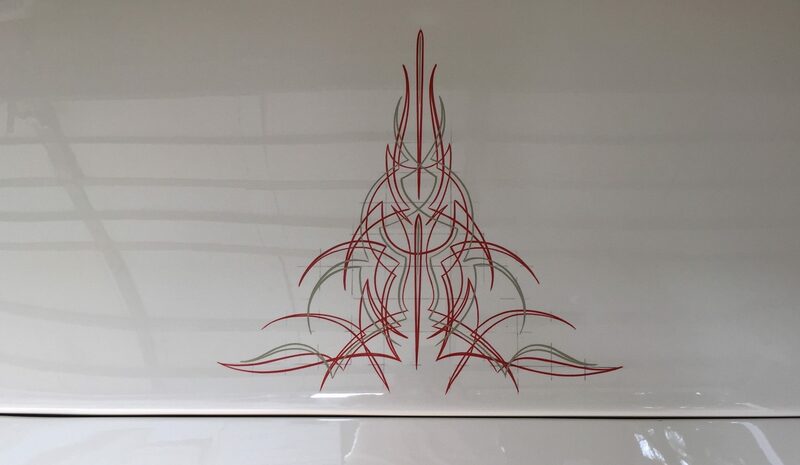 I make hand painted designs and/or stripes on cars to provide them with additional creative expressibility. 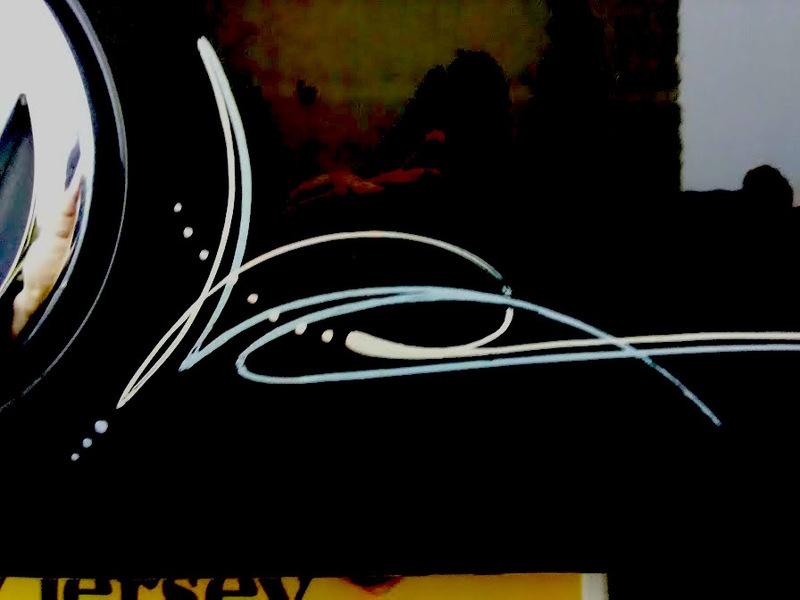 This is a side-stripe header for a design I did many years ago. Here we chose two lighter shades of pastel-toned paint to sit on the hard black of the vehicle. The design attempts to work with the contour of the car body, manifesting as the vehicle’s signature. This design is seen in side-view and has a space-bending, deterministic flavor to it. Here we can see a targeted ambition flowing in a calm yet energetic aura. Here we create style out our car’s “natural” geometry. As an expression, this side stripe header makes a signature at the termination, leaving a unique footprint. 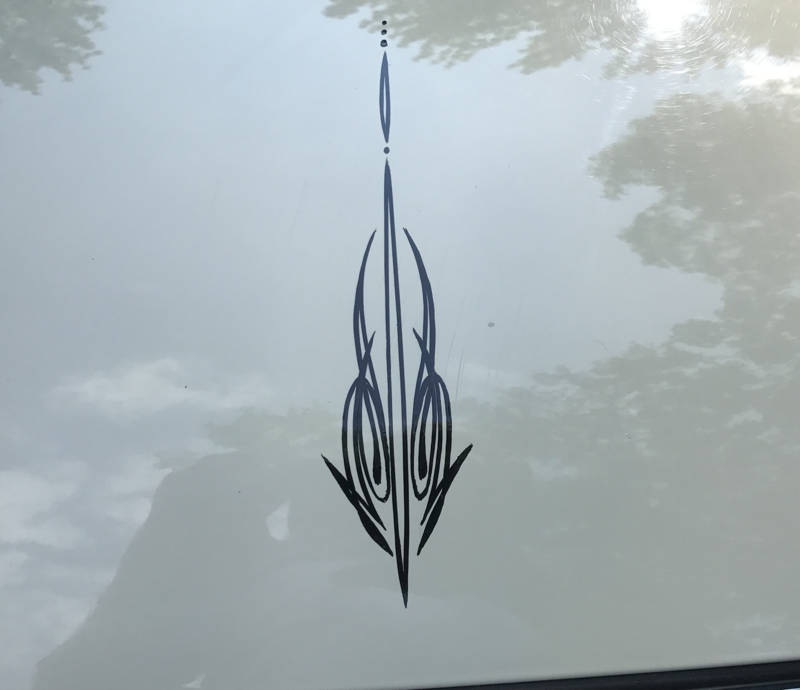 I can make a customized design on your car at my home in Farmingdale, NJ. I ask that, if you are interested, to please allow for leaving your vehicle and/or components at my house for later pickup. I also can stripe parts in a “you-mail-me,” “I mail-you-back” setup. Thank you for your patience – no work rushed is as good as when given time to attention. 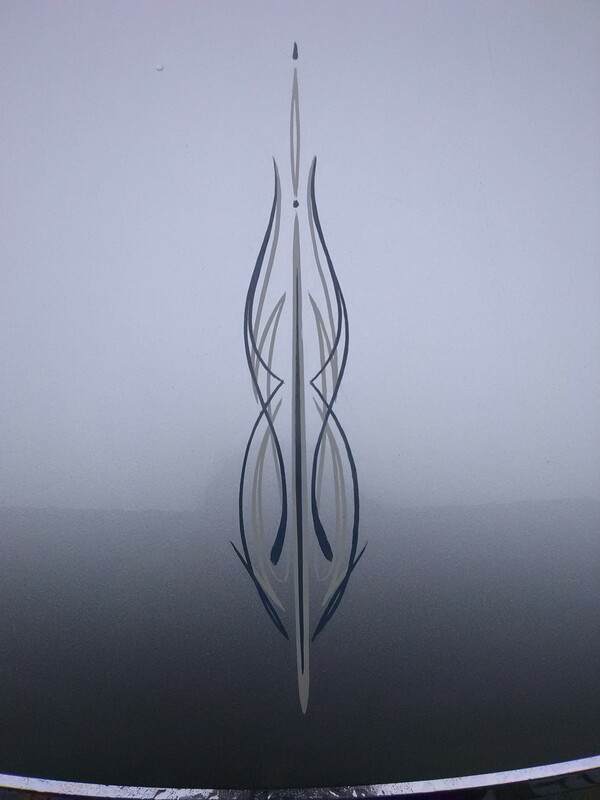 Auto pinstriping is a speciality service I have been offering since 1986. I do modern and old-school designs, all hand painted. This design has a subtle, three dimensional appearance. The white design forms an interlocking pattern with the light red-brown design. Both colors stand on the natural red-brown of the vehicle producing a three-dimensional effect. Here we have a symmetrical pattern, red paint on a yellow vehicle. Because both of these colors contrast each other strongly, the design is highly visible. This has that age old, patriotic vibe to it. Here we are able to conveniently add a stylistic touch of patriotism needing only to recreate colors found in the Chevy emblem. While the vibe is unmistakeable, we shouldn’t fail to see the added layer of abstraction to be discovered here. 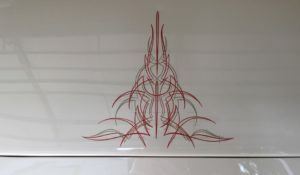 This abstraction is found in the “old school” pinstriping style. 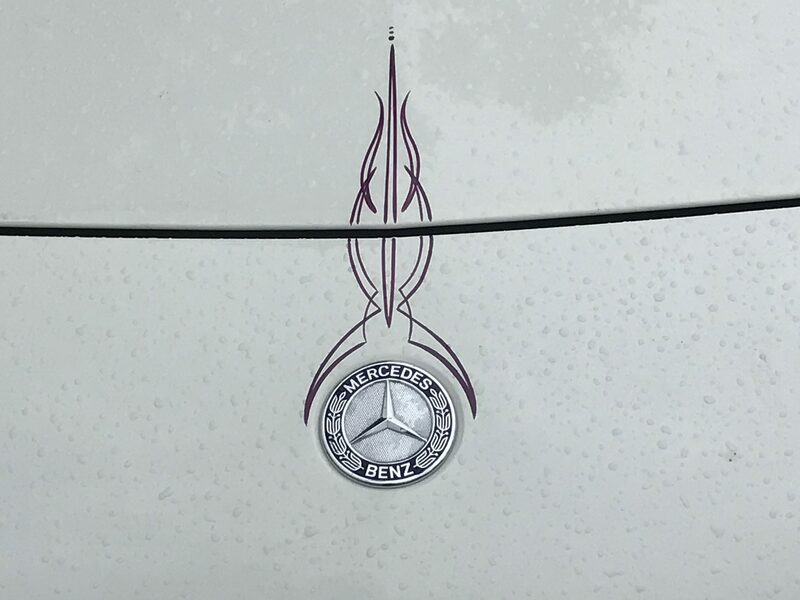 Here we have an abstract flame ornamenting the Merecedes-Benz emblem. The sharp design communicates the pep and dexterity of the vehicle. The dark red sits strongly atop the natural white of the vehicle providing an intense appearance, hidden just below the surface. This dart shoots right down the hood of the vehicle, creating its striking appearance. The design creates sprite in this vehicle, even while it is in full-stop. We use only black here but are still able to detect the design’s depth. 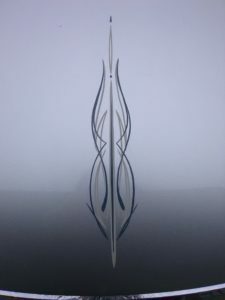 Here we have a symmetrical, 3d design that almost seems to be hovering in space. We also detect a certain flow to this design, transforming the hard, ultra-logical, solitary black into an image with a hidden positivity. 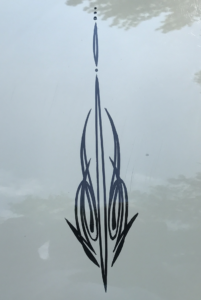 For those in the tri-state area, I pinstripe out of my house in Farmingdale, NJ. You are able to drop off your vehicle and/or your components for pickup at a later date. 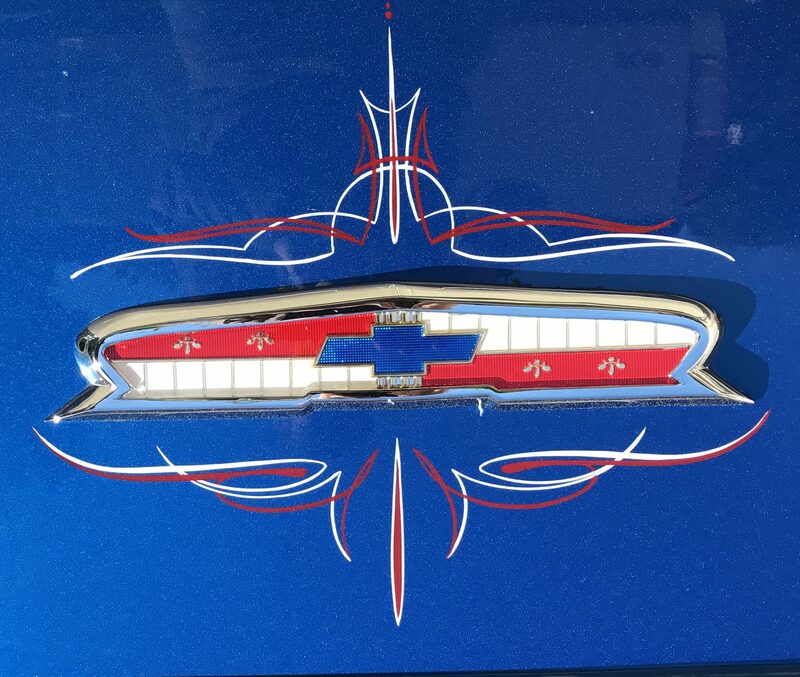 If you are out of town, contact me about my you-mail-me, I-mail-you-back pinstriping service. 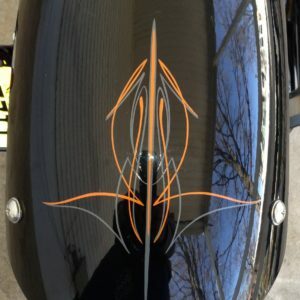 As a striper for over 32 years, motorcycle pinstriping has always been a speciality of mine. 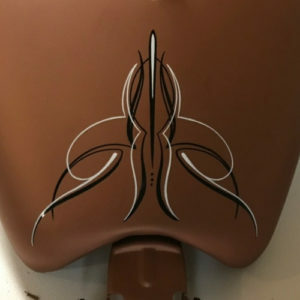 I hand-paint my designs, typically in an “old school” style, to enhance a motorcycle’s overall appearance. 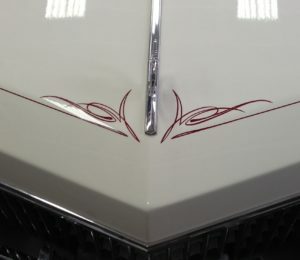 The old school pinstriping style is what you are seeing in the images here. Notable about this popular style is its abstractness, balance and color coordination. 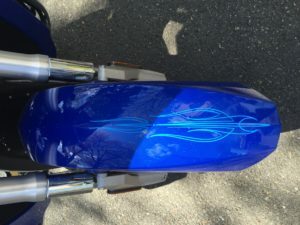 It adds definition to your bike with a streamlining effect. In the neighboring image, note how the symmetrical design guides with the curvature of the rear fender – this way, bike and design both work to compliment each other. Also note subtle yet distinguishable color harmony. Here I created an earthy effect on this gas tank. 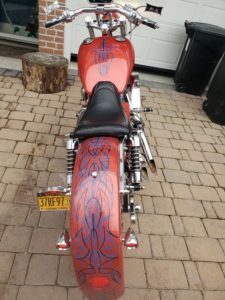 What we ended up with is something that leaves a natural, subdued impression yet is prominent enough to add obvious aesthetic value to the bike. A triadic color harmony, as seen here, opens up an almost limitless amount of creative possibilities. For example, if I had chosen different colors, I could have created an entirely different effect while still working with the brown of the tank. As there are many variations I can achieve with color, be sure to communicate to me exactly what effect you’re after. I have the experience, and can most likely get you close to what you are looking for. In this next image, shown is once of my most recent motorcycle projects. Here, my client wanted something to make his bike stand out, and, as you can see, the end result is certainly eye-catching. Using a blue color here was an obvious choice, given how well it stands against the bike’s red; yet, the complimentary black connects the design to the bike’s other components. 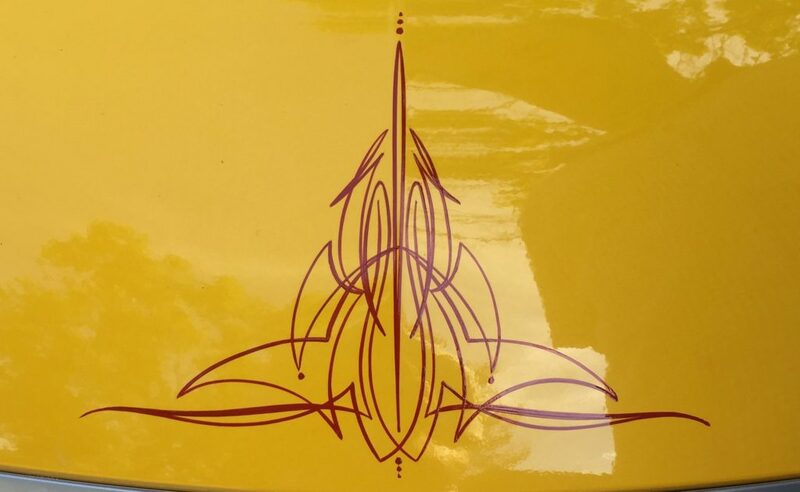 Stylistically, we used old school symmetry on the tank and a complex abstraction on the fender. I stripe out of my home in Farmingdale, NJ. If you are interested in having me stripe your bike, I will require that you leave the bike or components at my place for a few days. Turnaround time is based on my work load. If you are out of the tri-state area or unable to get to me, I can stripe your bike components on a mail-to-me I-mail-back basis. Thank you for your interest and patience. I hope to meet with you soon. 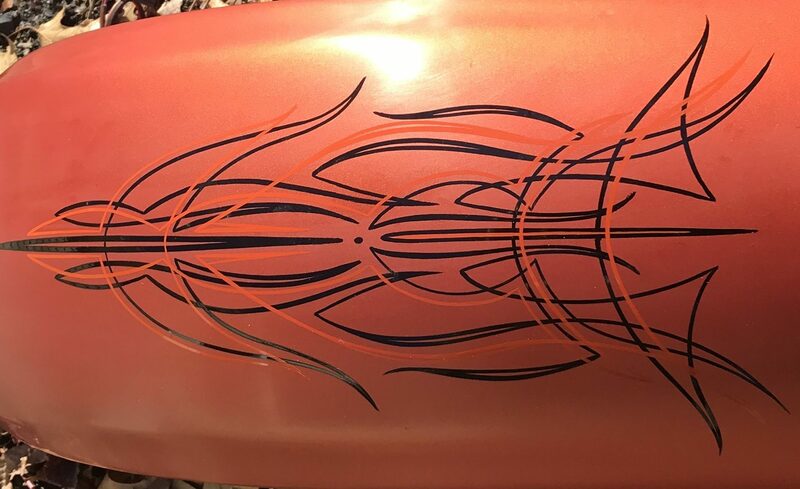 Since I started my trade thirty-two years ago, car pinstriping has been my main area of focus. 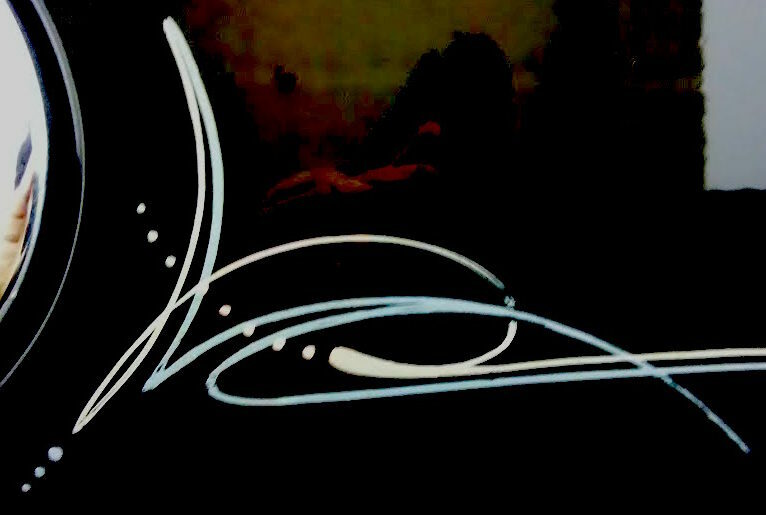 I do strictly hand-painted pinstriping using One Shot lettering enamels. 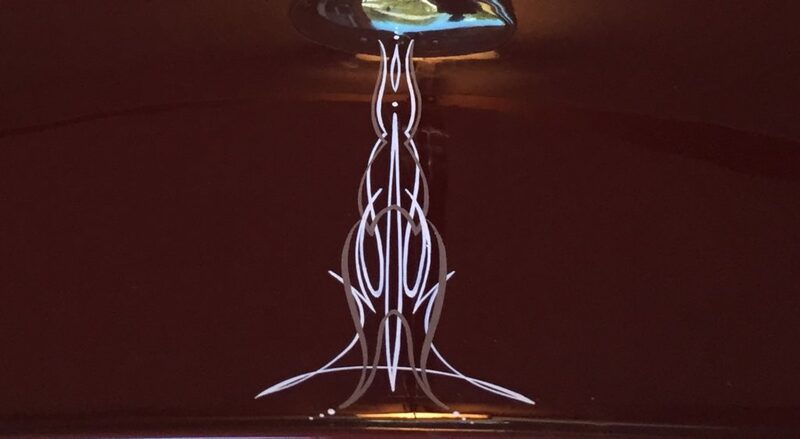 Yes, old school style pinstripers still exist, and you know their work when you see it. 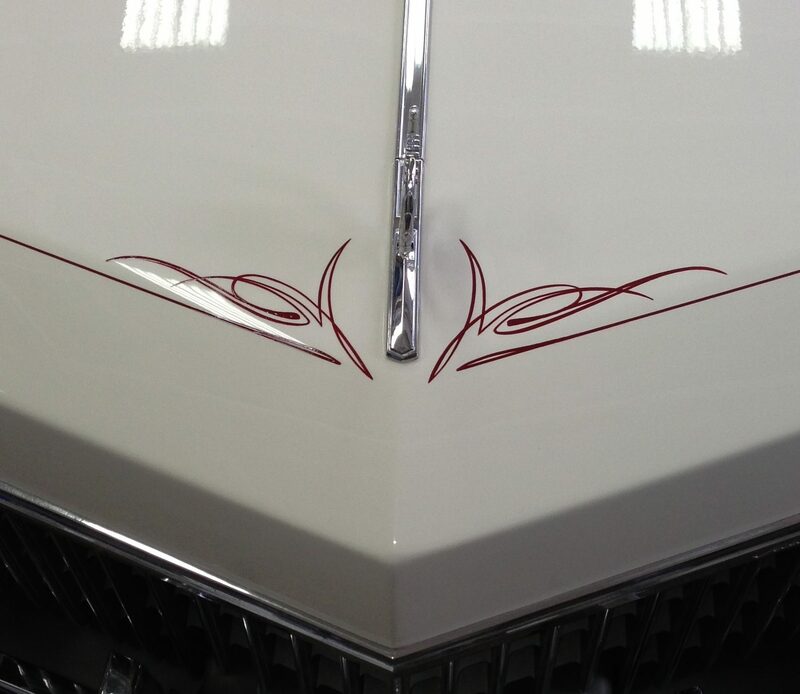 A hand-painted pinstripe defines the body lines of a car, and with new model produced, pinstriping adds definition. Harmony is key – when its comes to aesthetics, we’re looking for that fine balance between prominence and subtlety. 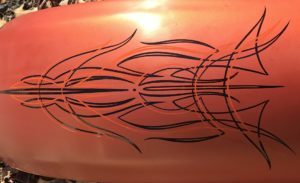 While I’m capable of duplicating any design that best fits your needs, I initially grew my business around the “old school” style of car pinstriping. 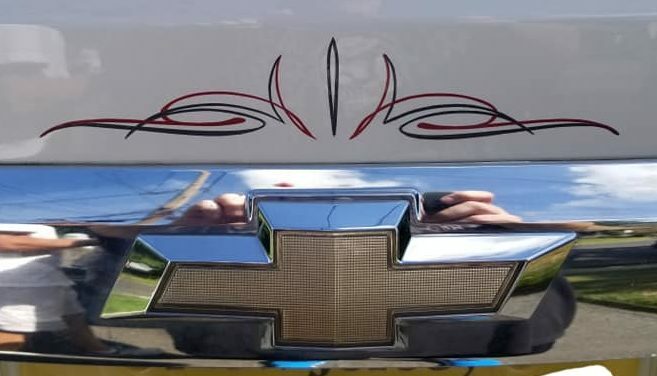 Old school pinstriping can best be described as a tight, intricate series of lines, often in symmetrical patterns, that complement the color and contour of the car. 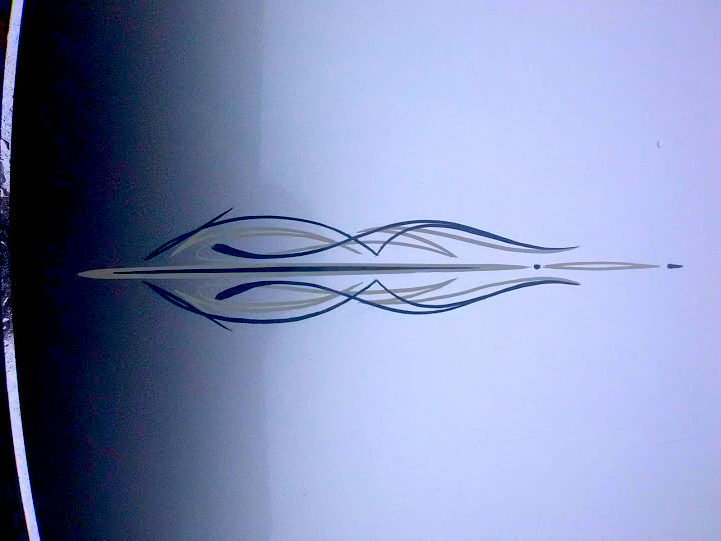 This style of pinstriping is typically abstract, representing nothing but keen aesthetics. The way I stripe, I honestly never get the same design twice – while I can make your stripe match the style I’ve used on thousands of other vehicles, your’s will be unique in its own right. Attention to detail is crucial as we create a design for your vehicle – there is no one-size-fits all approach. Color matching is something that I’ve gained a knack for over the years, as it is a crucial component in a good design. Complimenting the exterior color as well as the interior color is the usual approach, but sometimes you might want to add “pop” with vivid colors. 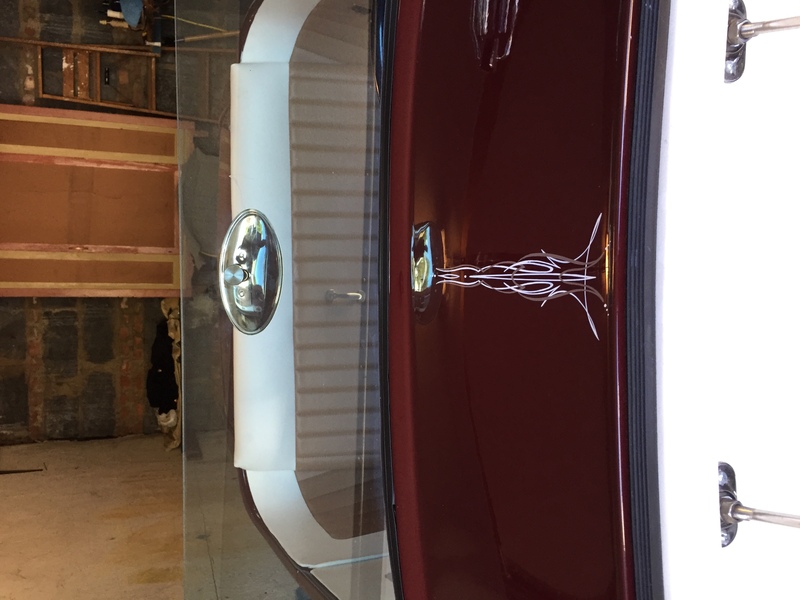 Popular to conventional wisdom, painted pinstripes can be removed without damaging the clear coat on the vehicle, additionally, if desired, you can go over the existing pinstripe with a totally different color. There is much that can be expressed through color choice, so I will help you discover what it is you’re trying to communicate through your design – this way, your stripe truly represents you. We will add expression to your stripe with careful color choice. I accept cash, credit cards and checks. I will pinstripe your car at my residence in Farmingdale, NJ. Turnover time is 2-3 days, depending on my work load. If you are looking for transportation out, I would recommend Lyft or Uber. If you are out of town, I can also stripe components on a mail away basis. Call 908.415.6574 and let’s talk about your stripe.